Palo Mayombe – the Dark Side of Santeria? Palomayombe.com was originally founded in 2001. Since its inception its primary purpose was to provide the world with accurate information about the religion known as Palo (aka Palo Mayombe, Palo Monte, Kimbisa). Over the past decade there have been a few articles and websites in English dedicated to Palo that give it a fair representation and accurately define the religion and its practices. Links to those sites can be found at the end of this entry. Because of this, it seems like today it may be more important to define what Palo is NOT rather than what it is. 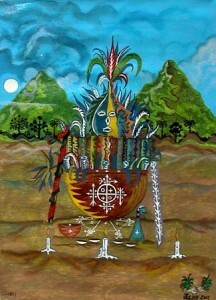 Palo is NOT the “dark side of Santería” this term is not only offensive and misleading but sadly enough is being used to describe the Palo religion in the mainstream media as well as to commericalize the religion and target those who are usually seeking a quick fix to a solution that will not be solved by these means. If what you seek is to harm people, the ability to do illegal things without getting caught, or to force someone to love you and you are quickly promised what your heart desires through the use of “the dark side of Santería” in exchange for large sums of money then you are being robbed. The purpose of these traditions is to cure an “illness.” It is important to note that illness however is not defined the same way in the Western world as it is among the Congo. Aside from illnesses that require aspirin for instance, illness can include loss of property, work, love and lack of success. In short, categories of illness and medicine in English and Kikongo overlap but do not coincide. Palo is evolving as its Afro-Cuban roots expand to other cultures. Once a religion practiced under strict secrecy, almost entirely based on oral knowledge, it now finds itself in the 21st century part of a highly advanced and technologically complex world. Palo is now adjusting itself to its new environment and charlatans who see every way to exploit this opportunity are adjusting along with it. Adherents are now more likely to be well educated, mobile and not easily convinced by spurious religious claims. Ignorance, fear, poverty, slavery and persecution are no longer the key elements attracting people to the religion. Therefore it’s imperitive that people learn as much as they can before seeking a path in Palo. Please note that this is not a religion where individuals “self initiate” or give themselves “promotions” to higher levels. Participation in a community of Paleros is critical to growing spiritually and within the religious hierarchy. Beware of Paleros that claim to be “powerful” or wise and make promises yet have no ties to their elders. While I encourage anyone that is looking into visiting a Palo priest whether it be to resolve a problem or to seek initiation to do as much research on Palo as possible it goes without saying that the intellectual effort one puts into research will never replace the guidance and wisdom of a godparent (when one belongs to a Palo temple the priest of the temple is referred to as the godparent) and the spiritual secrets that are shared in the Munanso (Palo Temple or House). Palo cannot be learned from manuals or books and intellect will never replace religiosity, but intellect helps us understand who we are and why certain things are done the way they are. The need to seek a balance between men and the creative forces of nature and our ancestors must be felt and practiced as a way of life, and together with intellectual learning, we become better human beings. To avoid fraud become well informed prior to seeking help from a Palo practitioner. Like any religious tradition, if you wish to eventually become an initiate your business should be to know the what, when, who and why’s of the religion.